Photo: Mordecai Zachary House, ca. 1852, North Carolina Highway 107, Cashiers, NC. Listed on the National Register of Historic Places in 1998. Photographed by User:RichardKenni (own work), 2011, [cc-by-3.0 (creativecommons.org/licenses/by/3.0)], via Wikimedia Commons, accessed September, 2015. Jackson County administrative offices are located at 401 Grindstaff Cove Road, Sylva, NC 28779; phone: 828-631-2295. The Town of Sylva was designated as county seat in 1913. Jackson County, constituted in January 1851 from Haywood and Macon counties and named in memory of United States president Andrew Jackson, remained predominantly rural through the late nineteenth century. Given that many land grants and property acquisitions encompassed sizable tracts, residents typically lived at great distances from each other, meeting at churches and in crossroads communities and small towns to socialize, purchase goods, and address business matters. 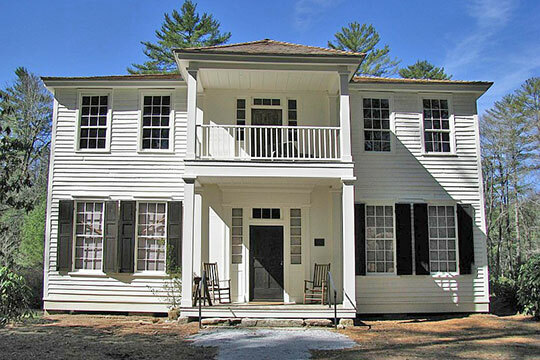 County court sessions convened in locations including Daniel Bryson Sr.'s home, Allen Fisher's store, and a church near Fisher's store until a courthouse's 1855 completion in the newly platted town of Webster. Although the governmental center soon attracted numerous inhabitants, the vast majority of the county's occupants operated subsistence farms. Some entrepreneurs were able to sell or trade surplus crops and agricultural products for locally made and imported commodities. Others engaged in manufacturing endeavors to generate supplementary income, processing raw materials such as corn, wheat, flax seed, and logs to produce meal, flour, linseed oil, and lumber. Industrial production increased exponentially after 1884, when the Western North Carolina Railroad extended its line originating in Salisbury to Jackson County. A fifty-year span of extensive growth ensued, with logging, mining, and tourism fueling the area's development. Heather Fearnbach, Fearnbach History Services, Inc., Downtown Sylva Historic District, Jackson County, NC, nomination document, 2014, National Park Service, National Register of Historic Places, Washington, D.C.